The LeConte-Woodmanston Plantation and Botanical Garden National Historic Site is open daily to the public for hiking, picnicking and self-guided garden tours. Guided tours are available by appointment only. Click here for details or contact us. 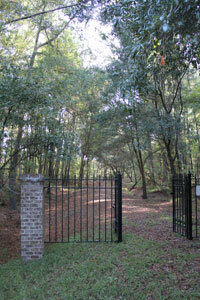 Journey back in time with us and explore the rich history of Woodmanston Plantation. There is much to learn about the LeConte family and the significant role African Americans played throughout the plantation's history. You'll also want to read about the history of Louis LeConte's famous gardens. You'll find all this information and more in our history section. Experience the mystery of the swamp and the beauty of our gardens, grounds and nature trails. There's so much to enjoy and explore! The "About Us" page will help you plan your visit and the "Beauty" pages will show you why you should come. The "Contact Us" page will provide you all the information you need about various ways to contact us as well as a map and directions. Discover the many plant, bird and animal species that bring LeConte-Woodmanston to life. The "Discovery" pages will offer little known scientific facts about them as well as providing interesting information about the plantation and its original inhabitants. You'll learn about native plants in the area and gain information about discoveries made by members of the LeConte family. The information we offer will change periodically. Our goal is to keep the information informative and to throw in a few surprises to keep it interesting! Envision our plans for the future. Our website will provide a window through which you can watch us develop and grow. LeConte-Woodmanston is changing on a daily basis through the efforts of our staff, foundation members and many individuals and organizations in the surrounding area. Our "News" page will keep you informed. After you find out what we're doing at LeConte-Woodmanston you may want to join us. Information concerning membership and how you can offer support can be found on the "Get Involved" page. The "Foundation" page will supply you with information about the LeConte-Woodmanston Foundation and its mission. The "Links" page will assist you in visiting the websites of many of our supporters and provide opportunities for you to gather additional information about the surrounding area. We'll do our best to give you an overview on this website but the best way to truly experience LeConte-Woodmanston is to pay us a visit. You will want to return again and again.